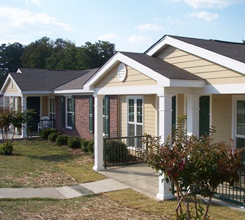 Established in 1945, Warren Williams Homes has 160 single family 1, 2, & 3 bedroom apartments conveniently located near the Columbus Museum and historic downtown area. These units include washer/dryer hook-ups, central air and heat, refrigerators, stoves and parking. Water is included but the resident is responsible for other utilities. The children can enjoy a playful afternoon at one of our playground areas. Our office is centrally located on the property for your convenience and our friendly maintenance staff provides top notch service. 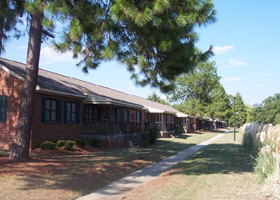 The Community campus provides various floor plans with flat and townhouse units. Our grounds offer tree lined walking areas and shady peaceful living. The grounds are located near the historic area of Columbus close to where everything happens; but giving you the relaxed feeling of a small town Family Community living. The community room is located within the rental office building and can be reserved for gatherings, meetings and recreational activities. There is an afternoon study hall and tutoring for the children. A Resident Council and Security Task Force have been established for our residents. The schools in the area are Davis Elementary, Marshall Middle School and Hardaway High. The community is close to the local hospitals and health department. There are several bus stops and the community is on the book mobile route. The community is located near major local banks, the main library, Cross Country Shopping Plaza and Weracoba Park and just around the corner from Lewis Jones Grocery Store. The families are also provided with programs that help them grow! The Ross Programs and FSS programs give the resources to make your dreams and educational goals come true.